February 12, 2016 / Steve M.
This being the third book and my fourth post on Montorgeuil, I am sticking with the spelling as it appears on the editions we are viewing. My interest in Montorgeuil is twofold, first because of the apparent mystery around his identity, and secondly how myth would have us believe that here was someone operating clandestinely , possibly in the 1930’s and providing works exclusively for wealthy collectors. 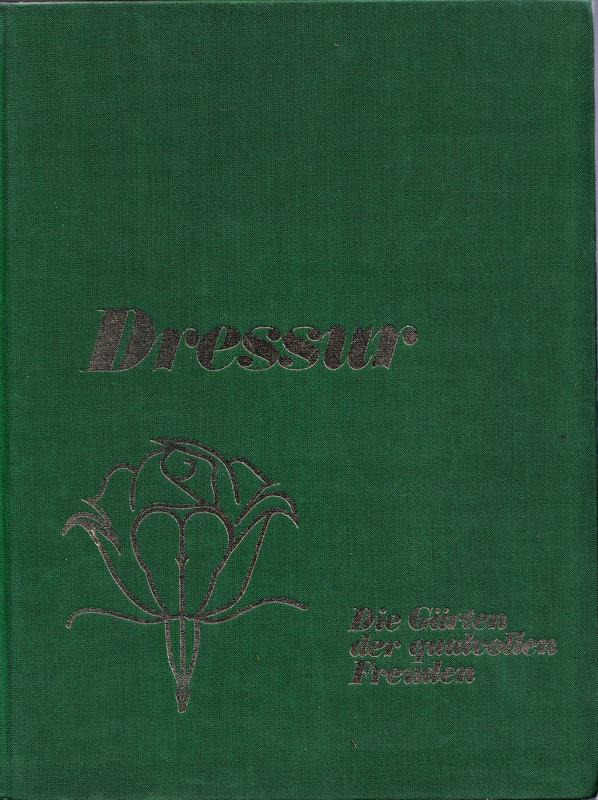 I am not convinced of this story, and certainly there is no published material prior to 1970, when Editions Bel-Rose in Rotterdam produced two identical four volume editions,one in German of the series ” Die Gärten der lustvollen Freuden ” or the French version “Les jardins des delices des supplices”, therse are rather lovely books in limited editions on fine paper, printed on only one side, and in most cases signed. Having explored the spelling of the name and having established via communication with Camillemm and Christophe Bier, that the spelling as it appears on the Bel-Rose editions both printed and signed, is not typically French either in sound or meaning. The only other progress I have made regarding the name is that it does appear to have a place in the Catalan language, and that there is a rue Montorgeuil in Paris. As interesting as this may be it takes no further forward with who the artist illustrator was and whether or not his work was in circulation prior to 1970. As i find being provocative quite productive, I want to explore a theory that appears to have some as yet unstated support, it has been suggested to me that Montorgreuil, (apparently regardless of spelling) is a fake, and interestingly only this week I purchased the last missing title from my Bel-Rose, French editions, from a book-dealer who has gone so far as to state as much, perhaps he has been reading this blog? I will not name him because that would not be fair, however given that I have paid for the book I feel at liberty to quote his description of it. 1 volume 6 feuillets dont 1planche en frontispice et 1faux-titre illustré, puis folioté de 1 à 40 (= 80 pages dont 40 de texte: verso vierge), 2 feuillets; 26 planches dont 1 double. Bon état (pâles rousseurs en tranche de tête). Reproduction en fac-similé du manuscrit autographe de Bernard MONTORGEUIL (souvent orthographié MONTORGUEIL), pseudonyme collectif de W. N. Schors, libraire et éditeur d’ouvrages érotiques, ou d’auteurs restés anonymes (notice B.N.F), illustré de 28 lithographies érotiques (masochisme masculin) de l’auteur. 3è des 4 tomes de la série (après “Les Quat’jeudis” (1er) et “Barbara” (2è), et suivi de “Une Brune piquante”),.tiré à 500 exemplaires; exemplaire justifié n°265, numéroté et signé par l’auteur, bien complet des 28 planches. 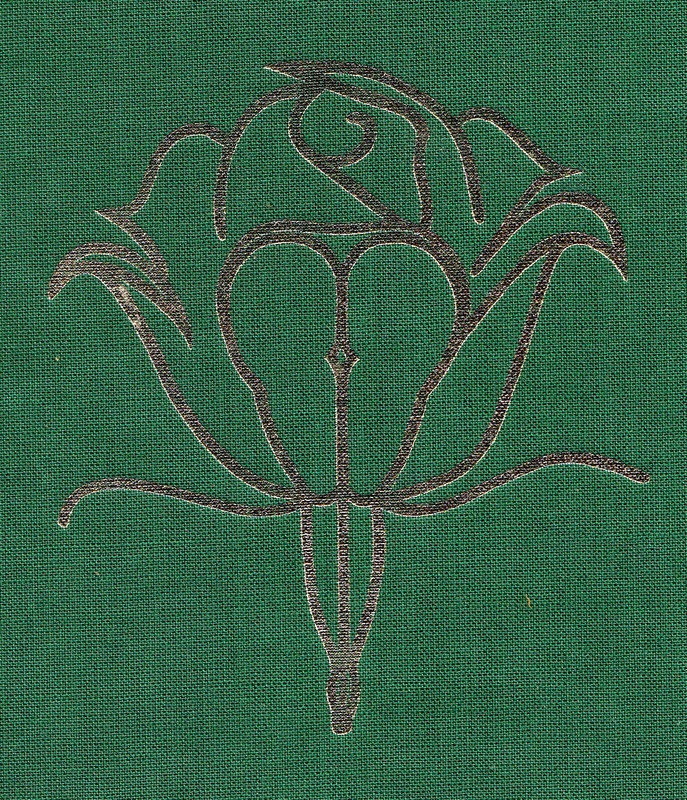 Livres Reliure éditeur pleine toile verte, titre doré sur le plat et au dos, ornés d’une fleur dorée. For those who do not read French, the interesting bit is the suggestion that the name Montorgeuil or Montorgueil, is a collective pseudonym fabricated by Schors the publishers of Bel-Rose, I have no idea where the information to support this idea comes from but I must admit that I think it is most likely correct. But how do we verify this?, however it is one thing to fabricate the name, but to go on to fabricate the signature and to sell the books as signed by the author/illustrator, surely that is more than mischief. 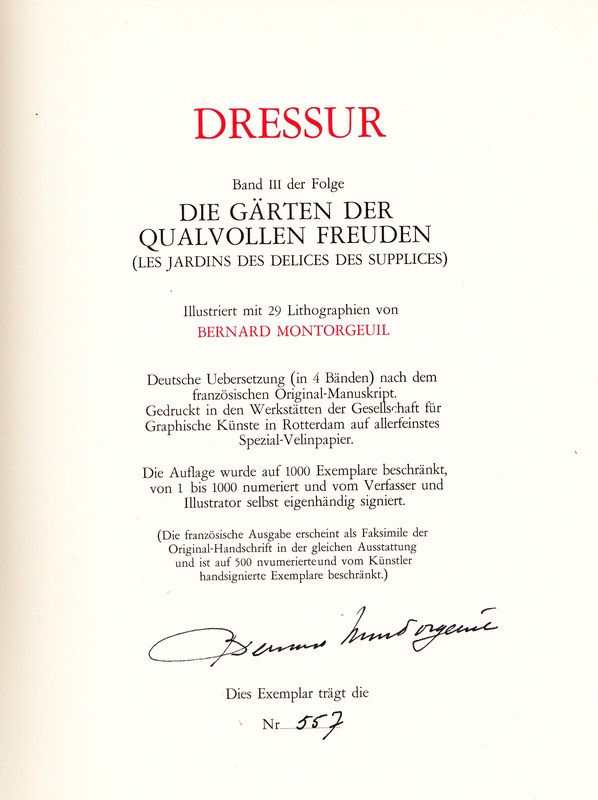 Then, what of the widely circulated information, including auction records that indicate that this Montorgueil, was one of the greatest artists of the genre in the last century, and that his work was clandestinely circulated in the 1930’s and 1950’s, one has to ask under what name?, if the identity was invented in the late 1960’s for publication in 1970, what was the artist called prior to that? and how can anyone have verified the authenticity of the manuscripts and artwork. A bit of a chicken and egg scenario, which came first the artwork or the name? Also a small matter of due diligence requires resolution on the part of the auction house. Well I am hoping that someone can fill in the gaps and put me right if I am wrong. Because the most important thing is that the artwork although completely twisted is stunning and very funny, I would dearly love to read the text in English. As for the detective work, I guess the biggest part of the puzzle for me now, is who the artist was, as if they really were producing work in the 1930’s they are undoubtedly deceased, whereas if they did not do the illustrations until the 1960’s they might very well be alive. 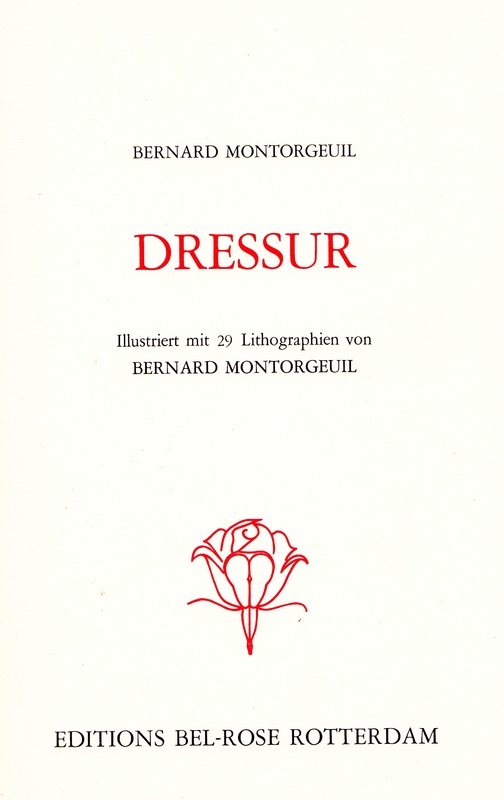 Bernard Montorgeuil, Dressur, Die Gärten der lustvollen Freuden, Volume 3 Editions Bel-Rose Rotterdam.n.d (1970) . 80, pages in a signed limited edition of 1000, copies with 26 + 1 double full page plates. Montorgeuil or Montorgueil: What’s in a name?